The first event of 2014 was at Silverstone using the International circuit layout and "The Wing" Grand Prix pits and garages. Friday testing was initially a shakedown test for the work we had done over the winter. In the second session the headlight unexpectedly flew off, bouncing off the top of the car and up into the sky as we braked into the first corner. Lucky no major damage done. I got faster in the afternoon and tweaked the car setup for dryer and faster conditions ending the day pretty happy. I got an early banker lap in but after finding space on track oil went down at the first corner and nobody could set faster times. I qualified 8th a little disappointed especially since most people went faster than Friday. I got a reasonable start but being on the outside got pushed wide and lost momentum leading up to and onto the long hanger straight. 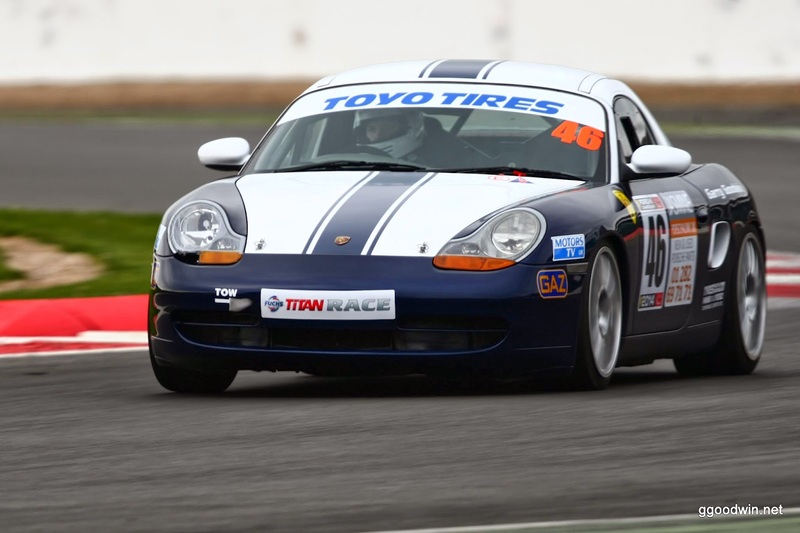 My manic first lap continued as I had to fend off a strong challenge from the leading Class-B boxster before going three abreast around the final turn. It took a couple of laps to get back past, but by then a big gap had opened in front. I was lapping very consistently for a 7th place finish. Wet conditions made it a tricky last minute call on rollbar and damper settings. It had stopped raining - the track was wet in places - but would it dry out? I got a flying start as others bogged down with wheelspin moving into 4th at the first turn. The front runners were pulling away on the straights but I managed peg them back in the corners and under braking. The back section of the track was very slippy. I got very sideways in the first two laps being to eager with my right foot. I got passed for 6th place but managed to keep pace and put the driver under a lot of pressure mid race. We reeled in the battle for 4th & 5th but the car in front spun at the final hairpin. I had to take to the grass to get by and so settled for 6th. Very happy with an equal best ever finish. Only a short break 5 weeks until the next round at Croft which is also a new circuit for me.